Mitigation Wetlands provide many functions including habitat for migratory birds, water retention and flood reduction, sequestration and degradation of pollutants, and sequestration of sediment and organic material. 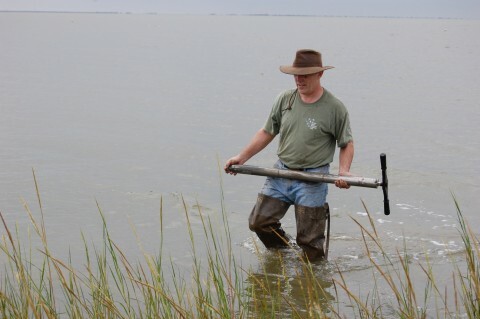 The breakdown and storage of organic material in wetland soils is particularly important for coastal wetlands. 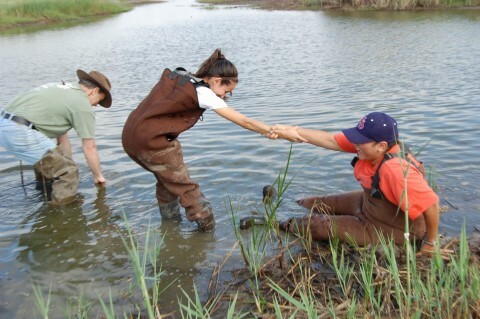 Federal guidelines require annual monitoring of the wetland plant community for 5 years, but it is clear from numerous studies that wetland soils take longer to become fully functional. It is unclear how quickly mitigation wetland soils can replace this function, however. The Harris County Flood Control District has constructed numerous mitigation wetlands including the Greens Bayou Wetland Mitigation Bank (GBWMB), the Little Cypress Creek Detention Basin (LCCDB), and the White Oak Bayou Watershed (WOBW). These mitigation wetlands were constructed at different points over the last 15 years and provide a means of studying succession trajectory within the Trinity River Watershed. The Anahuac National Wildlife Refuge (ANWR) is a well-established coastal wetland which represents the climax community for this watershed. Sheldon Lake is a fresh water wetland of intermediate age. Taken together, these areas provide examples of mitigation wetlands at less than 5 years, approximately 10 years, 15 years, 25 years, and nearly 50 years after construction. My research has assessed the succession trajectory of the diatom and arcellacean communities in each of these locations to determine the rate and extent of mitigation success in the GBWMB. The GBWMB diatom community seems to have stabilized approximately 10 years after construction. The GBWMB also became similar in diversity to the ANWR, and genera richness at GBWMB decreased to levels similar to ANWR. These trends have been stable over the last three years of the study. The total number of tests counted per gram of soil remains an order of magnitude lower at the GBWMB relative to the ANWR, however. The most interesting aspect of the results of this study is the sudden appearance of the succession signal. Diatom succession is an indirect indicator of microbial succession. This apparent boundary effect may be an indicator of soil Eh due to microbial succession. Anahuac National Wildlife Refuge (ANWR) is an undisturbed natural coastal marsh that spans 34,000 acres and is located adjacent to Bolivar Peninsula in Galveston, Texas. The wetland was established in 1963 as a Wildlife Refuge. The Refuge serves as a habitat for many animal species and plant flora. Shoveler Pond is a pristine fresh water wetland within the ANWR that supports diverse flora and wildlife populations. The species diversity at the wetland remained stable until was struck by Hurricane Ike, November 13, 2008 (Hoge, et al.). The storm was recorded as a Category 2 hurricane, with wind speeds of 96-100 mph on the Saffir-Simpson Scale, caused a 13-foot storm surge . It also caused severe damage to the wetland due to direct wind speeds, debris from Bolivar Peninsula, and saltwater intrusion from East Bay. The salt water intrusion caused a dramatic change in the species diversity that resided in the marsh. These changes were observed at a microscopic level through the study of the death assemblages (thanatacoenoses) of diatoms and arcellaceans. Statistical analyses were used to study changes in alpha and beta diversity of these organisms before and after the effects of Hurricane Ike. Alpha(a)-diversity is a measure of the species richness in a particular ecosystem. Beta(�)-diversity is a measure of richness and relative abundance. The study was expected to show that stable assemblages present before Hurricane Ike changed over two years as the death assemblage formed, and that the assemblages began to show recovery in the third year. Shannon�s index was used to exhibit the a-diversity of diatoms and arcellaceans at the ANWR. Both Sorenson�s similarity and Bray-Curtis dissimilarity indices were used to study �-diversity. The use of both S�rensen�s and Bray-Curtis measurements allowed us to determine the impact of rare genera. Results from Shannon�s Index show low a-diversity prior to Hurricane Ike, a drastic increase in a-diversity after the hurricane, and no recovery in a-diversity in year three. S�rensen�s index showed a recovery a may have occurred, though it was not possible to show that the amount of change was significant compared to trends in previous years. Bray-Curtis measurements were more dramatic, however, indicating that changes in �-diversity did occur and were due mostly to the introduction of rare genera. An example of such rare genera include Elphidium spp. and Trochammina macrescens; these are examples of foraminifera, which are not generally found in freshwater aquatic systems. Two years after the hurricane the wetland has began to show signs of recovery such as new growth of plants and a return of wildlife. Most recently, the drought of 2011 has caused parts of the wetland to dry up. Further studies will indicate how the drought will affect the wetland ecology and the time required for the ecosystem to recover. Wetland microfossils are often used to interpret fluctuations in sea-level, though it is difficult to interpret fine-scale changes due to time averaging and taphonomy. Biogeochemical influences during lifetime, preservation, and fossilization make it particularly unlikely that any single taxonomic group will be preserved in all wetland environments. Studying multiple taxonomic groups distributed across overlapping ecological gradients but with contrasting taphonomic histories can provide a record of fine scale sea-level fluctuations, however, because carbonaceous, siliceous, and proteinaceous species within and across taxononomic groups often have contrasting ecological requirements and taphonomic signatures. Rapid changes in sea level producing accretionary phases separated by transitional phases are indicated by the combination of a thanatocoenosis from the previous assemblage altered by the taphonomy produced by the biogeochemistry of the intruding waters and the addition of species from the subsequent biocoenosis. Accretionary phases tend to preserve assemblages unique to each marsh type. Rapid sea-level rise is indicated by a mixed fresh and salt water thanatoceonosis, while rapid sea-level fall is indicated by an extreme reduction in preservation. National Oceanographic and Atmospheric Association Bay and Watershed Education and Training (NOAA B-WET) program. Six high school students were also involved with undergraduate research teams in 2007 and 2008 through the UHD START Program. Two high school teachers from the Aldine Independent School District were involved with research through the UHD Noyce Program during the summer of 2012. Colon, F. and Hoge, B. 2013, Quantitative and Qualitative Assessment of a Proposed Method for Chemical Abstraction of Diatoms from a Clay Soil Matrix, 18th Annual Conference, Proceedings with abstracts, Texas Chapter of the Society for Ecological Restoration, Junction, TX, November 2, 2013. Colon, F. and Hoge, B. 2013, Quantitative and Qualitative Assessment of a Proposed Method for Chemical Abstraction of Diatoms from a Clay Soil Matrix, 14th Annual STEM Graduate School and Internship Fair, University of Houston - Downtown, Houston TX, October 18, 2013. Mulkey, L. and Hoge, B. 2013, Diatom Succession at the GBWMB: The Tenth Year of a Ten Year Study, 18th Annual Conference, Proceedings with abstracts, Texas Chapter of the Society for Ecological Restoration, Junction, TX, November 2, 2013. Mulkey, L. and Hoge, B. 2013, Diatom Succession at the GBWMB: The Tenth Year of a Ten Year Study, 14th Annual STEM Graduate School and Internship Fair, University of Houston - Downtown, Houston TX, October 18, 2013. Rosales, A. and Hoge, B., 2013, Comparison between Greens Bayou Wetlands Mitigation Bank and Anahuac National Wildlife Refuge using Diatom data to show how IKE and the 2011 drought affected these wetlands, 12th Annual UHD Student Research Conference, University of Houston - Downtown, Houston TX, April 12, 2013. Rosales, A. and Hoge, B., 2012, Comparison between Greens Bayou Wetlands Mitigation Bank and Anahuac National Wildlife Refuge using Diatom data to show how IKE and the 2011 drought affected these wetlands, 17th Annual Conference, Proceedings with abstracts, Texas Chapter of the Society for Ecological Restoration, Lower Rio Grande Valey, TX. Thammavongsa, G.; Cacho, C.; Aquino, E.; Hoge, B.; and Barnes, R., 2012, The Effects of Hurricane IKE on a Natural Wetland Ecosystem, MAA Undergraduate Poster Session, Joint Mathematics Meetings, Boston, MA, January 6, 2012. Aquino, E.; Thammavongsa, G.; Cacho, C.; Hoge, B.; and Barnes, R., 2012, Analysis of Diatoms and Arcellacean death assemblages to determine inclusion or exclusion of rare event data in comparison with various missing data analyses techniques, MAA Undergraduate Poster Session, Joint Mathematics Meetings, Boston, MA, January 6, 2012. Varghese, J. and Hoge, B., 2006, Diatom Succession within the Greens Bayou Wetlands Mitigation Bank, Student Poster, SACNAS (Society for Advancement of Chicanos and Native Americans in Science), Annual Meeting, San Antonio, TX. Garmany, K; Williams, T. and Hoge, B., 2006, A Study of Diatom and Arcellacean Primary Communities for Measuring Succession in Mitigated Wetland, Student Poster, WAESO/MGE (Western Alliance to Expand Student Opportunities/Mountain States Alliance) Annual Meeting in Tucson, AZ. Williams, T.; Garmany, K; and Hoge, B., 2005, A Comparative Study of Arcellacean Assemblages for Measuring Succession in Mitigated Wetlands, Student Poster (second place award winner), Sigma Xi Annual Conference, Seattle, WA. Varghese, J. and Hoge, B., 2005, Diatom Succession within the Greens Bayou Wetlands Mitigation Bank, Student Poster (third place award winner), Sigma Xi Annual Conference, Seattle, WA. Lang, D. and Hoge, B., 2004, Diatoms as Indicators of Wetland Mitigation Success, Student Paper Presentation, Texas Academy of Sciences Annual Meeting, San Antonio, TX. © University of Houston - Downtown. All rights reserved.